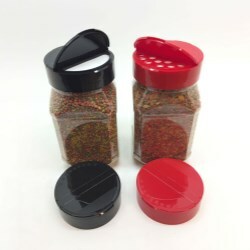 Sprinkle caps offer a convenient way to dispense food in small or fine particles without adding an excess to the plate. Conveniently including a number of apertures for easy dusting, the consumer controls the amount added with the shake of the wrist. Part of the company's standard cap selection, Kornelis' 3734 sprinkle cap is an updated version of its successful, existing 63mm cap, ref: 3558C. Benefiting a continuous thread, the closure can be screwed down securely to ensure a snug fit with the food container and can also be supplied with a variety of liner options for optimal product protection and freshness. Sprinkle caps offer a dual benefit to the consumer. In addition to ensuring that an excess of food particles are not added to a food dish through the comfortable dispensing system, the caps also provide a security barrier to external contaminants as the product is safely contained within without the need for a separate overcap. Kornelis' 3734 cap also benefits an extra-large aperture for moments when a larger amount of product can be dispensed. Herbs, spices, fish food, cake decoration sprinkles and sweeteners can all benefit from the use of a sprinkle cap. 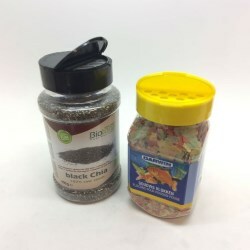 In addition to food products, toy and decoration products can also benefit from this style of cap from paint powder to jewellery beads and glitter mix, enabling a limited amount to be dispensed at any one time. Full details of the 3734 sprinkle cap and the company's other closure offerings can be found in Kornelis' product catalog. What finishes and dispenses options are available with the spice, etc. dispensing caps? Are the same sizes available from Kornelis as from Stull in the US? If so, what is the MOQ in both stock and custom color?